A simple class to print SSRS report directly to the printer. There are comments. Feel free to leave your comment. 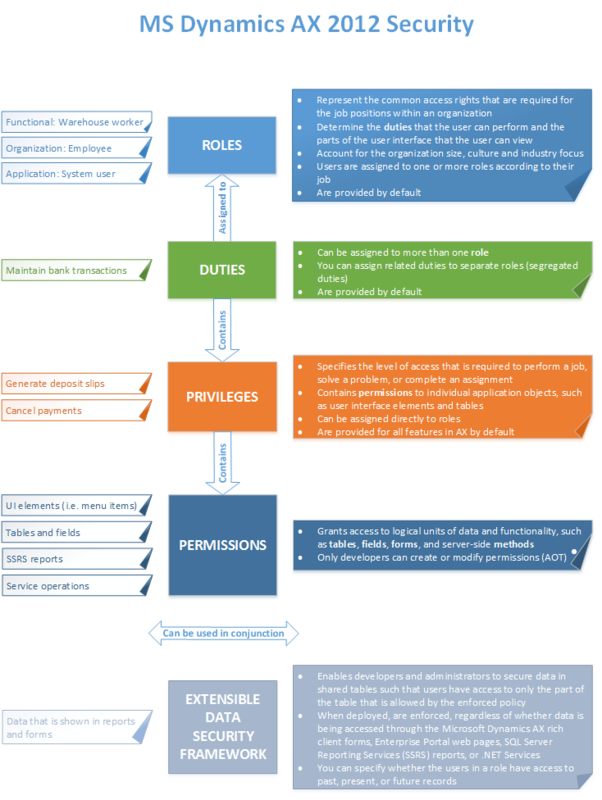 Here is the summary of Dynamics AX 2012 role-based security concepts such as roles, duties, privileges and permissions. This diagram can help to understand their relations better and remind about them when needed. It took me a few days to get my head around Model-View-ViewModel (MVVM) pattern. I was reading various books as well as following tutorials that I found on internet, but I was still struggling to fully understand how MVVM does it’s magic. A simplified example from AD User Import Wizard on how to retrieve AD user details via X++. It may be useful when the wizard doesn’t return all information that you need about system users. Create a new Project Project > Shared > New > Project and give it a name. Having all created/modified objects in a single project will help you to be more organised and will allow you to easily export your work to production environment. Below you will find a list of things that I was struggling on whilst making this kind of setup to work for the first time. Let’s say we have some Control in a Form of type CheckBox, Button or StringEdit and we want it them once modified/clicked to update the form grid by selecting all the records in a grid. TCP/IP Client based on a few examples found online. Making those examples to work turned out to be a tricky task, so I’m sharing what finally worked for me. An X++ example of getting the data from a bit more complex XML string. Here you can find a tutorial on making XML string in X++. An example of Query to find InventSerials, when Works Order is known. An example of achieving same result using While/Select statements. Proudly powered by Pelican, which takes great advantage of Python. Brighton, East Sussex, United Kingdom.